Hard skinned with 2″ tube-thru-center construction. Design allows boat to be secured directly to mooring chain. Foam filled with a blue stripe. 24inch has a 3″tube. A mooring buoy can help act as a shock absorber as it allows the bow to easily ride up wave crests without putting extra strain on the anchor itself. 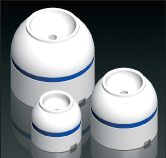 Hot-dip galvanized collar protects your T3C mooring buoy from wear. Designed to work with all standard shackles. Mooring collars are sized to slip into the top of 2inch or 2 1/2inch tube dia. Our new mooring buoys. Hard skinned with 3″ tube-thru-center construction. Design allows boat to be secured directly to mooring chain. Foam filled with a blue stripe. Cal June mooring buoy. Hard skinned with 2 1/2″ tube-thru-center construction. Design allows boat to be secured directly to mooring chain. Foam filled with a blue stripe. The 18″ and 24″ have a built in shackle pocket and new flat bottom design to stay upright and be more visible. 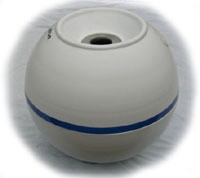 The 30″ Drum style is a low profile buoy to help protect your bow from getting damaged.